This Case History covers an automated system built for a remanufacturer of vacuum pumps to remove a variety of contaminants from inside and outside housings and components in batch loads. Some of the residues can react with the cleaning agents resulting in corrosive fumes that must be exhausted from the system through a scrubber. Therefore, the system design has to satisfy not only the immediate process requirements but the environmental concerns. 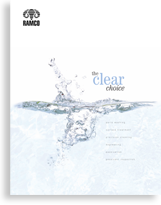 The RAMCO Aja-Kleen Series was chosen to handle the weight load and basket size. Each stage accommodates a 30″ long x 24″ wide x 12″ high basket with a maximum gross weight of 500 pounds. The line runs right to left. 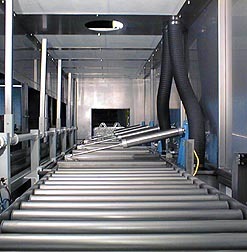 The system consists of an immersion wash, overflowing rinse, cascading rinse and hot air knife blow-off dryer. 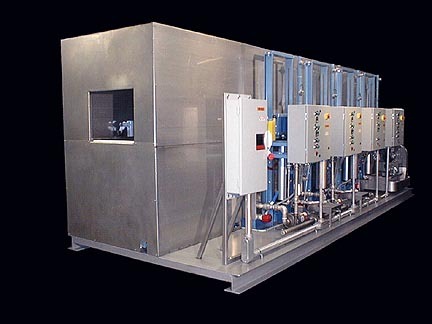 Turbo/filtration systems are used for the wash and first rinse stages. The parts are dried in a very effective hot air knife/blow-off drying stage. Each stage includes digital cycle timers and temperature controllers. The system is built in accordance with Nema 12 electrical and NEC codes including the control panels, switches, pilot lights and lockout-tagout disconnect switches. 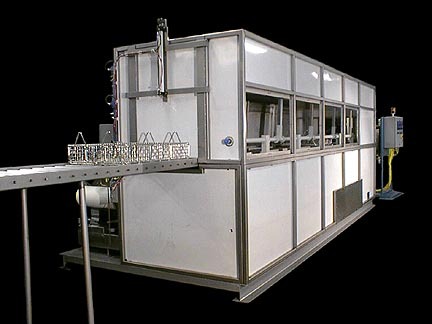 The system is fully enclosed using stainless steel panels. The entrance side (above) abuts a wall. The baskets are fed through the opening via a roller conveyor section. 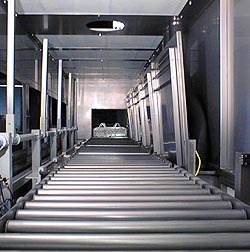 Platform roller conveyors are included on each elevator to facilitate transfer between stages. Although the system is fully enclosed automatic opening/closing covers are provided for each stage (see above right). This feature saves on heat and reduces the amount of fuming by keeping the processing tanks closed throughout the cycle; only opening the covers for loading and unloading. The exit side of the system is shown below (front panels are photographed with the protective white paper on at customer request). A guillotine door is sequenced with the automation program to open only at the end of the cycle for unloading. The operator control station for the RamTough Automation System is shown at the far end of the line. Here is the Automation system in action.